SSMPA calls for SSFL Cleanup target date to be pushed back. has oversight authority for the cleanup at the former Santa Susana Field Laboratory. Early August 2013: NASA released a statement (DEIS) on the impacts of its plans for completing the cleanup of its land (~450 acres) at Santa Susana Field Lab (SSFL). 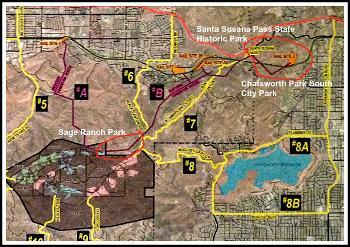 Early September 2013: Santa Susana Mountain Park Association (SSMPA) posted a draft version of its thorough evaluation of NASA's statement. Late September 2013: SSMPA posted its final version of its evaluation of NASA's statement. SSMPA sent its evaluation to NASA officials and to 35 local political officials and agencies. NASA must acquire from California's Department of Toxic Substances Control (DTSC) important missing information, and NASA must issue a corrected, comprehensive DEIS that provides decision makers adequate information to make an informed decision on how the cleanup should proceed. Read SSMPA's full evaluation HERE. SSMPA provided scoping comments to the U.S. Department of Energy (DOE) in April 2014, requesting items to be included and addressed in DOE's yet-to-be-prepared Environmental Impact Statement (EIS) for the cleanup of SSFL. SSMPA commented on NASA's Draft Environmental Impact Statement (July 2013) for cleanup at Santa Susana Field Lab. Supporting materials, extracts from referenced documents. SSMPA provided scoping comments to DTSC in January 2014, requesting items to be included and addressed in DTSC's yet-to-be-prepared Program Environmental Impact Report (PEIR) for the cleanup of SSFL. What are stakeholder organizations saying about NASA's DEIS? SSMPA is compiling dozens of public comments on the recent DEIS from NASA. The compilation contains comments on 10 topics by 10 organizations. Bookmark this page. SSMPA thinks the compilation shows how much unanimity there is among the organizations.